The use of colocation services has continued to increase, rapidly becoming the solution of choice for organizations requiring an efficient, secure and cost-effective way to manage their IT infrastructure. 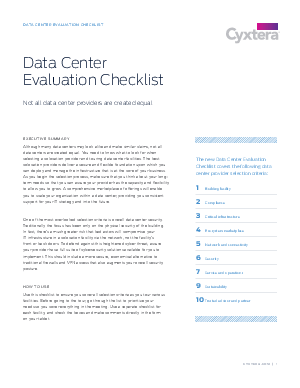 But data center evaluation, and picking the right partner, can often be difficult. Colocation providers deliver a stable foundation upon which you can support your core business and execute on your IT strategy – but not all data center service providers are created equal. As you compare data centers, it is critical that you compare the providers across key criteria so that you better understand everything that is included in their offering — and what is not included.